Why are high-fibre foods important? Increasing our intake of foods high in fibre has a whole host of benefits. Our stomachs are conditioned to hold a certain weight or volume of food. The presence of fibre serves to breakdown and reduce calorie dense food that is not-so-easily digested. High fibre foods include beans, peas, lentils, fresh fruits and vegetables. Whole grain foods also meet the grade; foods such as whole wheat bread, couscous, Bulgar wheat and brown rice. Of course, filling up on the good stuff means we have less appetite for high calories foods such as cake, pastries and pie! A high diet fibre, particularly soluble fibre is shown to lower the rate of glucose absorption into the bloodstream, which in turns lowers the rate of insulin production: A reduction in insulin production will lower the rate of fat formation. Read NHS tips on how to get more fibre into your diet. This handy guide from the British Nutrition Foundation introduces swaps you can make to increase your intake of fibres by nearly 100%! 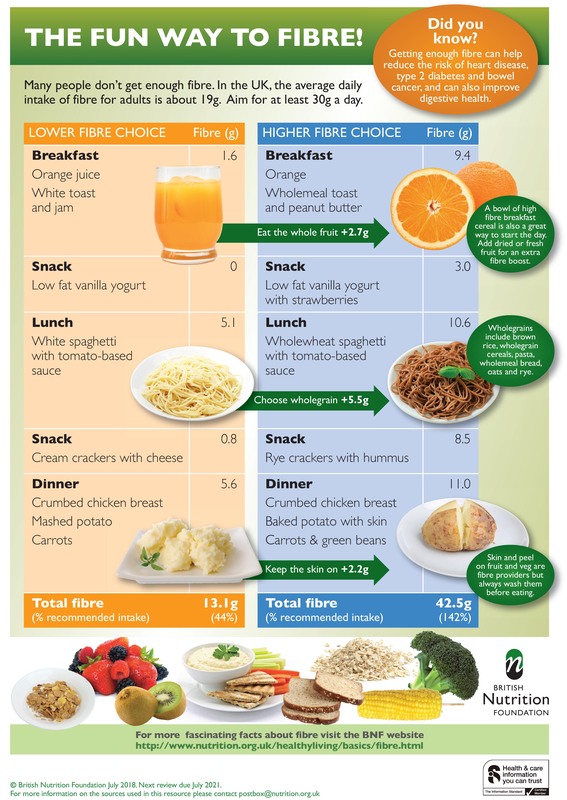 The British Nutrition Foundation has also produced this helpful high fibre meal planner. Register to create your healthy living profile today and get personalised tips and support for your lifestyle goal. Consider how the support of our Wellness Coaching can help you take steps to manage your weight. A member of our coaching team can talk with you on the phone regularly, encouraging you to make and stick to your plan! Register and contact us to discuss coaching.